Finding yourself face to face with a bowl FULL of this come-as-you-are eatery’s thick-cut, bright-red chunks of raw tuna is a lot like preparing to dive into a room full of money... except it’s much more delicious and you’re not Scrooge McDuck. 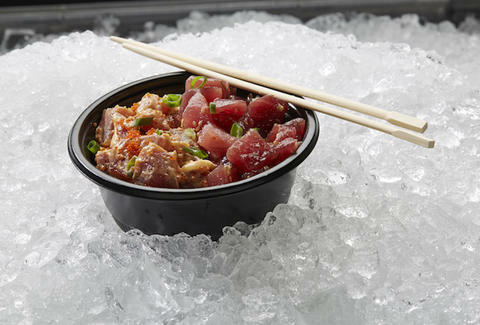 Choose between the shoyu poke (fresh-cut tuna marinated in soy sauce and sesame oil, then topped with sesame seeds and green onions) or, our favorite, the spicy ahi marinated in Sriracha-mayo, and topped with ikura (fish eggs) and white onions, all laid over a scoop of brown or white rice. While at first glance Andy’s may not stand out, the sign on the front door touting fresh baked bread is no joke, and the sandwiches aren’t either. Served on homemade, whole wheat bread, these sandos come packed full of the works. 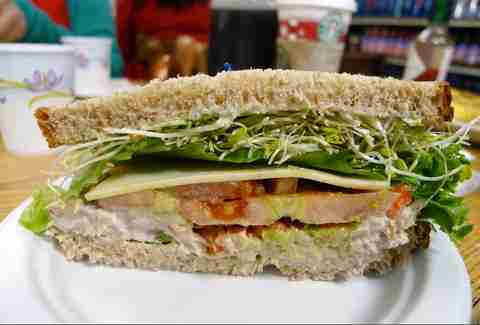 Before heading up to hike Manoa Falls, get a tuna, avocado, tomato & cheese, with Andy’s house-made smoked ahi spread (sort of like a smoky tuna salad), and crunchy bean sprouts. At $6.25, you’ll not only feel like you’ve gotten a bargain, but have plenty of money left over for one of its 20+ smoothies post-hike. Like any good ramen place, Ezogiku is about the quality of the noodles. For the novice ramen eater, you really can’t go wrong with the miso ramen, but if you’re looking to mix it up a tiny bit, the shoyu ramen is killer, topped with char siu, fish cake, and green onions. If you’re willing to go over $10, we also suggest the fried rice or the crispy pork gyoza. Yes, it’s a hole in the wall, and there may be a line to get in, but once you get your seat at one of the many counter spots in the center of the room, your food will come out quickly and piping hot. Rainbow Drive-In has been a Honolulu establishment for more than 50 years, and not much has changed since it opened... other than a fresh coat of paint on the rainbow every once in awhile. 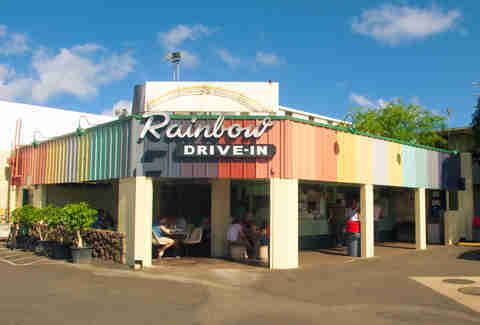 While many are loyal to the plate lunches, those in the know will tell you Rainbow Drive-In has one of the best loco moco bowls on the island: a solid scoop of rice, a standard burger patty (this isn’t that farm-to-table nonsense), topped with a fried egg and drowned in gravy, all smashed into a Styrofoam cup. It is simple, it is salty, and it is the sort of thing you will crave at the strangest moments. LIke right now. While hip and trendy Lucky Belly is one of the hottest places to get a dinner reservation, the real deal is its late-night take-out window. Open from 10pm to 2:30am Thursdays through Saturdays, The Window at Lucky Belly serves up a constantly changing, limited menu, with each item typically going for $5. Previous items have included bacon kimchi fried rice and pork belly bao, so you’re bound to get something worth remembering in the morning. For all those musubi lovers out there, if you haven’t been to Manu Bu’s, it is most likely because you have heretofore been unwilling to drag yourself out of bed to get there before it sells out of everything (which it typically does well before 1pm every day). We are here to tell you to GET OUT OF BED. 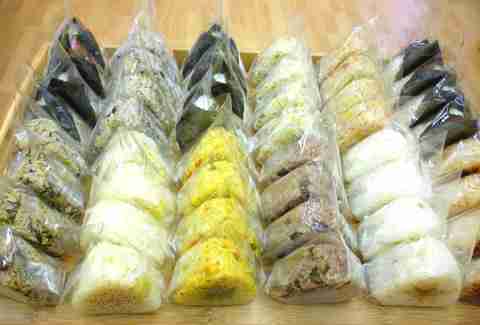 On weekdays, its 35 entirely hand-made musubis hit the shelves at 6:30am, so you best be setting your alarm clock because there is a reason these award-winning babies fly off the shelves while they’re still steaming. While most people know Diamond Head Market for its famous blueberry cream cheese scones (which are truly fantastic), its grill also serves up a some mean lunchtime eats. The place is about as no-frills as it gets, with Styrofoam takeout boxes and limited outdoor seating, and so is the Ahi Steak Sandwich: a hefty slice of tuna, grilled and seasoned in wasabi and soy sauce, topped with the classic LTOM (lettuce, tomato, onion, and mayo) and tossed into a hamburger bun. If you can’t find a spot at the picnic tables, just take it on over to Kapiolani Park and prepare to chow down. As we’ve already told you, Honolulu has its own version of fast food, and you’ll definitely see more of these around than a McDonald’s. 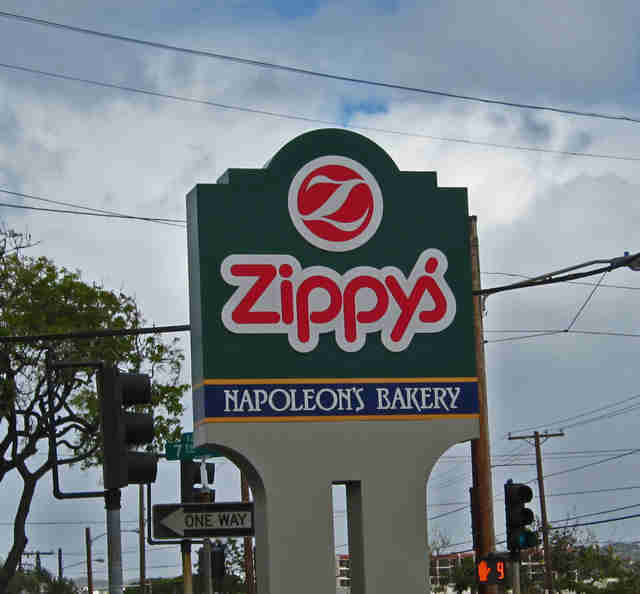 Since 1966, Zippy’s has been serving it up fast, cheap, and local-style. While some locations have table service, most are casual order-at-the-counter joints with those plastic takeout boxes. For a classic Zippy’s meal, go for the Chili Plate with sides of rice and macaroni salad and a solid portion of chili. As it says on the menu, the chain sells more than 200,000lbs of its chili every month, so it’s got to be good, right? Right?! From Chef Ed Kenney (of Town), Kaimuki Superette is a seasonal sandwich shop complete with a small breakfast menu. With items like an egg, kale, and Brie sandwich, and a daily rotating selection of local, prepared vegetables (plus, side salads like roasted roots, or Swiss chard Caesar gloriously on display), it’s a go-to spot for a healthy, yet flavorful lunch. The daily melt comes with a side of mixed greens, and can range from a pork terrine with whole grain mustard and port salut on rye, to a simple ahi salad sandwich with cheddar. Be warned, there may be a lunch rush, but it’s worth the extra few minutes. When it comes to udon, Marukame is as legit as it gets. The broth is made with Japanese-imported ingredients in small batches to ensure the flavor is perfectly balanced, and the noodles take hours of preparation that can change with the weather... Yes, that’s right, these masters of noodles are so precise in their cooking, they change the boiling time of the noodles with the seasons, and at the Waikiki location, you can actually watch them work in the display kitchen right up front. 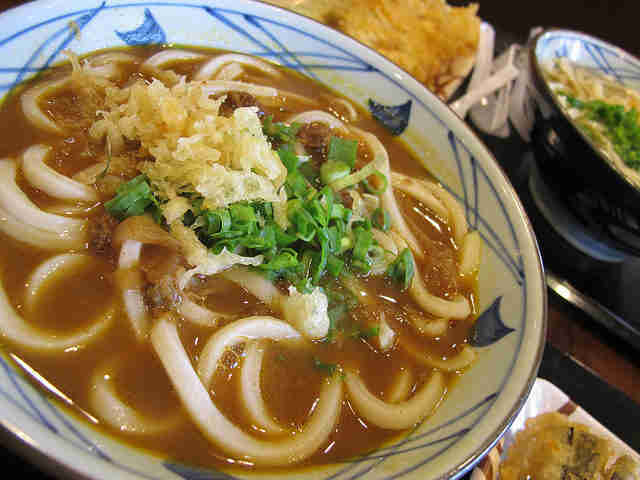 Pro tip: go for the curry udon -- Marukame’s perfect noodles, topped with just-the-right-amount-of-chewy shredded beef, crispy fried tempura flakes, and fresh scallions, all tossed in the mouth-watering curry broth.